Now the crazy focus of the Ravellenics is passed I can return to my normal scattergun approach to my crafting. 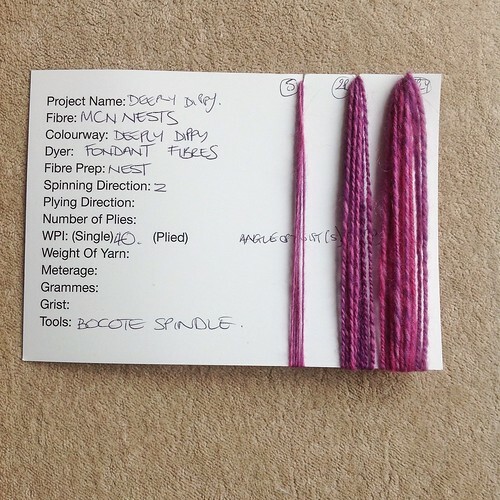 Whilst I loved not having to think about anything but the two projects I was working on during the Winter Olympics, I did really miss being able to flit around my different projects, as my mood took me. This flexibility in crafting means that I can usually find a project to match my mood and situation, such as when I can hardly keep my eyes open, let alone concentrate, I can knit vanilla socks or do some spinning, or when I'm bored and there is nothing on the tv that interests me I can work on a complex shawl. It also means that my hands and body get a change. As I craft around the clock I need to change needles, yarns and crafts quite frequently in order to change my posture and the shape of my hands as they hold the fibre or yarn. Concentrating on two projects for two weeks went against all the acquired habits I have created in an endeavour to extend my crafting time each day. One of the things I missed, during the second week of the Ravellenics, was spinning. I got my cowl spinning out of the way in the first week and then I didn't pick up the spindle again until my second cowl was finished. I missed it so much! For the last few days I have been obsessively spinning some gorgeous nests from Fondant Fibre. The colourway is Deeply Dippy and it is an MCN blend. It is like spinning pink clouds! I've never spun this kind of prepared fibre before. The fibre is combed top which is then pre-drafted and made into palm sized nests. It drafts so incredibly easily and the fibre is so soft, it is the most straightforward spinning I've ever done. I was quite proud of myself with this particular project, because I spun some samples before starting the project properly. I spun a nice single that wasn't too thick, nor so thin it fell apart as the slightest touch, and then plyed it into a two ply yarn and a three ply. I soaked both of the plyed samples and retained the singles as a reference for during my spinning. After looking at the samples I decided I liked the appearance of the 2ply as I think it looks more delicate and would be nice to work up as a light garment. Plus, if I spin a 2ply yarn it will have greater yardage! I am also using a new toy with this spinning, which is making the activity even easier. I found it on eBay, where I often look to see if anyone is selling their support spindles, as they are quite difficult to get hold of in the UK. I stumbled across a seller I'd not seen before, who was selling several different types of spindle, including support spindles. I was really tempted to buy a Tibetan spindle but I've been bitten by buying from unknown woodturners before. What was available from this vendor was a support spindle bowl, something I have wanted for a while, and something I felt I could take a risk on. 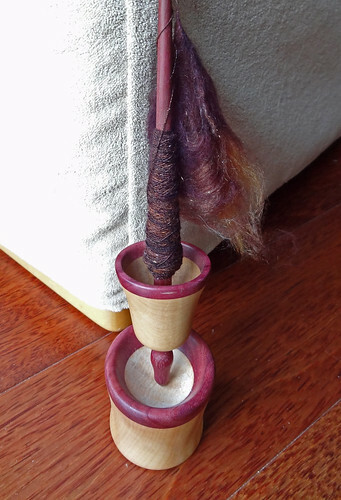 I have a bowl that came with my first spindle from IST Crafts, but I wanted something that would sit more stably in my lap and not tilt so easily. This bowl is excellent if you are spinning on a stable surface (or a smaller lap than mine), but I've wanted a different style of bowl for some time. I'd seen one on a couple of US makers' sites and really liked them, so to stumble across a UK maker was a real bonus. This style of bowl is a stemmed support spindle bowl. The stem sits between your thighs and holds the bowl steady. The bowl is shallow and wide with a small dimple in the centre to keep the point of the spindle in place, and it sits neatly in your lap. 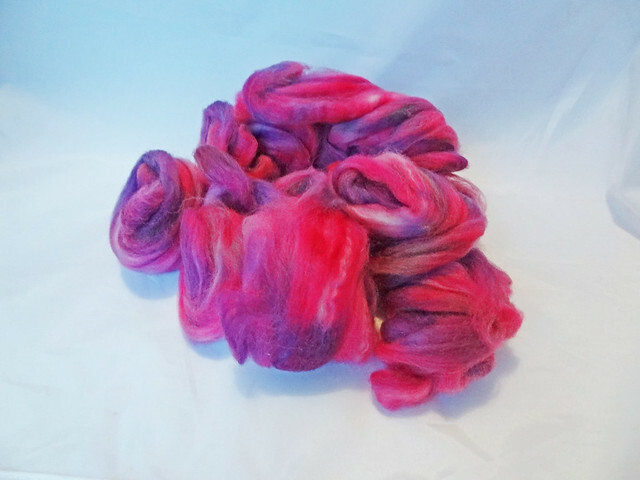 It is a very stable platform for spinning and as I mainly wear trousers I can use it most of the time. It also means you can adjust the height of your bowl a little by raising where the bowl is held using the stem. I like the actual object, to look at, as well as to use. There is something so tactile about turned wood. The new bowl is working out really well. As you can see from the fat cop! I've got about two thirds of my nests spun and wound onto a plying ball. I'll do end to end plying by winding the single onto a nostepinne and making a centre pull ball. 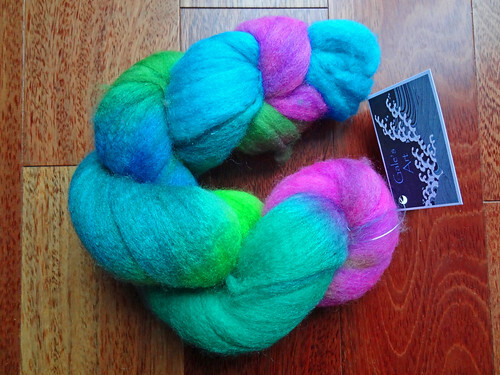 It has been such fun spinning this fibre and I think it is going to make really beautiful yarn. Isn't it pretty? I will hate for it to end, but I already have the next spinning lined up to console me. I've got some lovely BFL from Gale's Art, waiting in the wings. It's sooooo fluffy! I blame The Fat Squirrel, she keeps raving about the preparation. I had to buy it! If you are thinking of doing some spinning in the next couple of months you might want to join me in my spin-a-long (#stsal2014). I have a few spinning prizes that have been donated lately so I want to share them with people who are spinners, rather than knitters. The spinning should not have been started before 1st March and it must be completed by April 30th. The prizes will include: Issue 3 of PLY Magazine (the Woolen Issue), a project bag from Fondant Fibres along with 100g of Pink Gradient Shetland Fibre and a set of stitch markers, and a set of red camel and silk punis from Elly's Knit (In)Sanity. 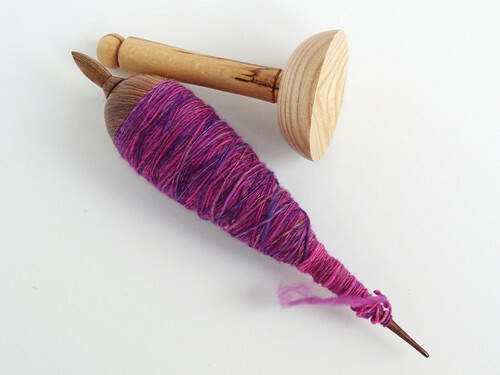 You must spin at least 100g/3.5oz of fibre, post a photo and details of the project AND a suggestion of what pattern or project you could use your yarn for. The entries will be posted in the relevant thread on my Ravelry Group Board, which will be opened on 1st March. I hope even if you can't spin, you might be interested in knitting with handspun yarn, and the suggestions for patterns that could be used for the yarn being spun, may serve as inspiration. 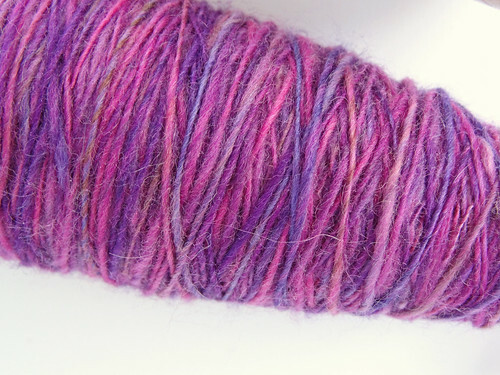 Many fibre vendors on ETSY also sell handspun yarn and it really is delightful to knit with. Maybe I can even tempt one or two of you to give spinning a go. The more knitters I lure over to the fibrey side the better!